The three parts of this book are designed to promote a continuing field-building conversation: a look back at foundational documents of the field; a set of provocative questions interrogating those foundational works; and a look to the future by the next generation of leaders in the field. The central part is the special 20th anniversary issue of the Journal of Higher Education Outreach and Engagement, which brings together key documents of the scholarship of engagement with reflections on those documents by key scholars and/or the authors of the original works. In addition to highlighting the foundations and evolution of the field, this work also looks ahead to the next generation of voices and views as input to the conversation, with a closing chapter that includes invited essays by nine outstanding community-engaged thinkers and writers of the next 20 years who share their ideas about probable futures. "Grounded in principles of mutuality, diversity and inclusion, integrity, and purpose, this book is a must-read for campus leaders. With an all-star group of scholars, this book synthesizes wisdom to inform our engagement with society. Colleges and universities cannot meet their missions of developing critical thinking, leadership, and moral citizens without this type of engagement in our communities." "Broad in scope, insightful, and comprehensive, this volume chronicles a critical movement that is profoundly shaping higher education. For anyone in the engagement field, from the most experienced to those just starting their careers, this is the must-have centerpiece for their professional library." "The editors have done all of higher education a significant favor in curating this remarkable collection of classic essays. Enriched with commentaries from some of today's thought leaders and inspiring practitioners, this volume truly sets a foundation for reclaiming the public and democratic purposes of higher education." 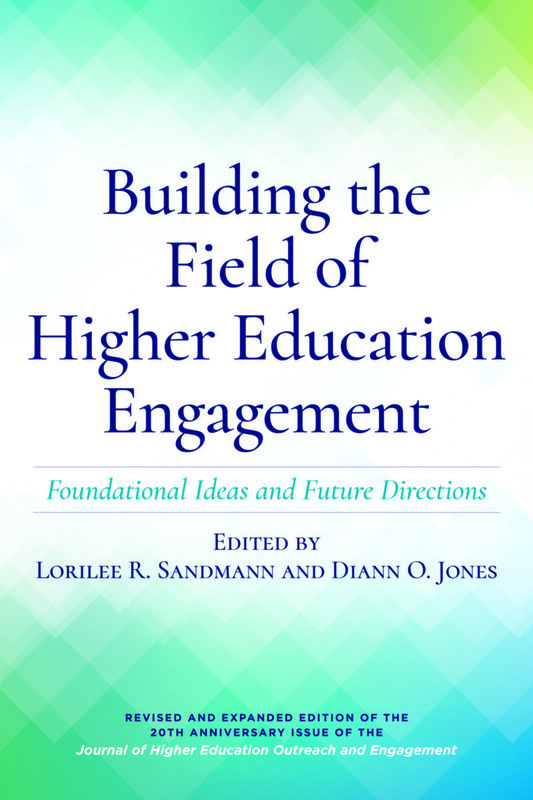 "Everything you needed to know about the scholarship of engagement can be found in this volume. This remarkable book plumbs the depths of critical social problems and how higher education is using not only its head but also its heart to help solve them." Samory T. Pruitt, Vice President, Division of Community Affairs, The University of Alabama; and President, Engagement Scholarship Consortium - . 10) Understanding an Emerging Field of Scholarship: Toward a Research Agenda for Engaged, Public Scholarship—Dwight E. Giles Jr. The Emergence of Engaged Scholarship: Seven Additional Years of Evolution—Dwight E. Giles Jr.
Lorilee R. Sandmann is professor emeritus in the College of Education at the University of Georgia. Diane O. Jones is a clinical assistant professor at the University of Georgia in the Department of Learning, Leadership, and Organizational Development.